As summer's greenery fades to gold I'm holding onto the warmth of September's golden sun by adding the color yellow into my life. Despite sundown's chill that is making me go into my storage closet and trade in my shorts for sweaters, I'm keeping my golden summer clothes within hands reach at least until mid October. Two other ways I'm celebrating the sunny days around the Autumnal Equinox is by creating sunflower sacred spaces around my house and painting my nails Margarita yellow. Classic Rita www.nailtini.com Free of the toxic 3 chemicals found in most nail polishes. Last weekend's Unlock Your Neck and Shoulders Workshop was enjoyable to teach because my upper body felt great as a result of my pre workshop prep work and the workshop itself. I'm also grateful that I was able to learn based on the comments made and questions asked, real concerns about our neck and shoulders while practicing yoga. Here are a couple of neck and shoulder yoga tips and questions answered that will keep you safe and feeling spacious in your upper body. When it comes to gazing upwards it is best on your neck and shoulders to not have deep wrinkling on the back of your neck. A good way to train yourself to do this is to interlace your hands as shown here and pull the base of your skull up like you're pulling your hair up. Then fall your head into the hammock of your hands. When you back bend which involves plenty of neck and shoulder opening it is important to note where you're bending. You don't want to neck bend and pull your chin far away from your chest. Instead think hammock of the hands like above. This will encourage safety and length in the back of your neck. While back bending you also don't want to stick your tail out, shorten your lower back and feel the pinch. Instead find space in your lower back by exhaling your tailbone down. When you back bend focus on drawing your shoulder blades together. Finding interlaced hands like shown here in yoga mudra will help you feel a back bend in the right place. How do I lengthen my arms into wheel pose? Urvdha danurasana, wheel pose is an extreme back bend and not easy for everyone to find. To practice lengthening your arms in this pose I suggest resting your back on a big exercise ball and lengthening your arms overhead. You can also practice close to a wall and reach your hands towards it with your fingers pointing down. Rest here and draw your attention to your breathe. Eventually you can try walking your hands down the wall. With practice your chest, neck and shoulders will open and your arms will lengthen. One day you just might be able to remove the ball and lengthen your arms in wheel pose. How do I get my upper body strong? Practice caturanga dandasana and arm balances like crow, bakasana shown here. Even if your feet, knees or one foot and a knee is on the floor, practice. The key for finding space in your neck and shoulders and strength in your upper body here like in caturanga dandasana is to have your wrists directly under your bent elbows. Focus on your breathe as you gaze forward and down from your hands. This will help you to balance and keep the back of your neck long. Glamorous Yogini, the book is a guide that offers 7 seasonal steps an earth and beauty loving female yoga practitioner can do to embrace her femininity, become fit and well along with easy to follow rituals, meditations and recipes she can practice to cultivate mindfulness to the changing seasons and herself. I started hearing the whispers of this book in my consciousness while I was pregnant at 40 with my second son. Like a voice that was crying out "Release me!" 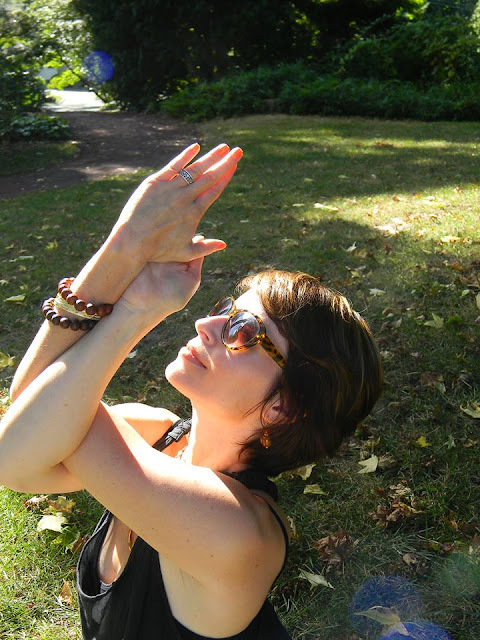 I began Glamorous Yogini the blog in early spring 2011 to simply get the words out. By the end of 2012, I had the book version in my hands. Since destiny would have me spending most of my days teaching yoga, running after an energetic toddler along with picking up and dropping off my teenage son to his super active life, this book was hand written on napkins and journals while sitting on park benches as my baby Krishna napped as well as waiting in the car for Ryan while he made his way off the field. I believe this is one reason why this book has such a Mother Earth loving Goddess feel to it, as much of it was written with the sun's rays moving through my pen on even the cloudiest and coldest days as I gazed deeply into the natural world around me. While I was blogging about living a modern yogini lifestyle before I wrote the book Glamorous Yogini it occurred to me that some things have not changed through the ages in being a woman. Dressing up, mothering, multi tasking, cooking, being crafty, wishing for the best, having an exercise regimen that gets better with age like practicing yoga, breath work and meditation along with doing as the ancients did by performing seasonal rituals to ground, center and be in harmony with the universe are steps that are necessary to practice over and over for some and in some cases pass through like a phase for others in order to cultivate the feeling of being a grounded and balanced woman. Examining the spiritual qualities of each of the 4 seasons. Learning the season's best yoga postures to practice to strengthen and ease you. Becoming aware of easy to do natural beauty regimens that are *Ayurveda inspired. Learning how to create sacred spaces to enjoy and rest in that align with nature's rhythm. Acknowledging the season's active ancient Goddess. Learning easy to whip up seasonal recipes to feast on. Learning easy to follow modern day versions of ancient rituals which are designed to empower your creations and align your energy with the present season. I've found that over the years following these 7 steps have helped me to stay slim, healthy and strong as well as to feel content as I wake up with energy while knowing that whatever I want will come to me because I create my world. Most thrilling of all is to have the understanding by way of yoga's wisdom that I will have enough as well as a surplus to give to others when I adhere to these 7 steps as my means to stay connected and not let depressive thoughts break me into pieces and block my forward movement. *Ayurveda is a natural medicinal practice from Southern India as well as yoga's sister science that believes nature's elements, earth, water, fire and space are within everything in the universe, including the birds, trees, rocks and us. Ayurveda's principle belief is to balance the elements within us with natural remedies. Doing so will cure us from the inside so the outside will shine.